We welcome people of the Los Angeles area to Beverly Hills Prestige Dental Group for the best in high-quality dental service and personalized care. The dental professionals at Beverly Hills Prestige Dental Group focus on creating bright, healthy smiles for each of our patients. With extensive dental experience and advanced training from USC School of Dentistry, our skilled dentist, Dr. Javdan, and his professional team are fully qualified to meet your dental needs. We use the best and latest dental technology and dental treatments to promote your oral health. At Beverly Hills Prestige Dental Group, our friendly staff will give you the individual attention you deserve in a caring and relaxed setting. Dr. Javdan will take the time to understand your priorities, answer your questions, and design a good treatment plan using comprehensive and holistic dentistry for the smile you desire. We at Beverly Hills Prestige Dental Group are dedicated to improving the quality of your life through optimal dental health and a beautiful smile. As a UCLA graduate, Dr. Javdan is proud to serve the Los Angeles, California area. As one of LA’s top dentist, he provides years of successful experience in cosmetic, general, laser, and implant dentistry. The wide range of dental services provided at Beverly Hills Prestige Dental Group span all areas of cosmetic and restorative dentistry. Dr. Javdan has been practicing dentistry as a cosmetic and holistic dentist in the Los Angeles area for the past 15 years. As a USC dentist, Dr. David Javdan is knowledgeable in the best, most advanced dental techniques and options, including ZOOM! professional 1-hour teeth whitening, teeth cleaning services, dental veneers, porcelain veneers, laser dentistry, non-surgical gum treatment, cosmetic smile makeovers, Invisalign (invisible braces for teeth alignment), root canals, dental implants, bonding, and white crowns and fillings (metal-free). At Beverly Hills Prestige Dental Group,Dr. David Javdan’s top concerns are the patient’s safety, strict sterilization, and comfort. He creates a pain-free process while achieving outstanding dentistry results. As a top LA dentist and top Beverly Hills dentist, patients trust our cosmetic dentist, Dr. Javdan, to provide good dentistry. Dr. David Javdan has set in place the safest most effective techniques and materials, in a state-of-the-art facility, for your specific dental needs. Your smile is an important aspect of your appearance. 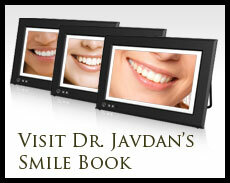 With today’s advances in dentistry, you can have a smile that you can feel confident about. If you are embarrassed with teeth that are misshapen, misaligned, stained, or chipped, Dr. Javdan offers the cosmetic dental services you need for a flawless smile. We make it a priority at Beverly Hills Prestige Dental Group to offer dental services at affordable prices. That’s why we provide interest-free payment plans for our patients. If you have any questions about receiving dental care from Beverly Hills Prestige Dental Group, please don’t hesitate to contact us. We will gladly assist you. We invite residents in the Los Angeles area to give us a call and schedule a time to see our USC dentist, Dr. Javdan, soon. The friendly staff at Beverly Hills Family Dentistry looks forward to meeting with you and helping you receive excellent dental care! Non-Orthodontic Teeth Alignment, Porcelain Veneer, As Seen on ABC’s Hit TV Show Extreme Makeover! Dr. David Javdan, our top Los Angeles dentist and a USC dental professional, offers a broad range of cosmetic dental services to makeover your smile, including cosmetic, laser, restorative, implant, and general dentistry. If you are searching for a Los Angeles dentist or a Beverly Hills dentist, visit Beverly Hills Prestige Dental Group for cosmetic dentistry in Los Angeles, including Zoom whitening, porcelain veneers, Invisalign invisible braces, bleaching, white or tooth-colored fillings, bridges, inlays and onlays made of porcelain, professional tooth whitening, bondings, porcelain crowns, dental implants, and sedation dentistry. We welcome patients from Beverly Hills, Century City, Santa Monica, LA, Hollywood, Los Angeles, Marina Del Ray, Culver City, Pacific Palisades, Brentwood, and West Hollywood, and surrounding areas, to Beverly Hills Prestige Dental Group for modern dental care from Dr. David Javdan. Dr. David Javdan also makes his cosmetic dental services affordable using efficient, modern care for painless procedures. Based conveniently in Beverly Hills, Beverly Hills Prestige Dental Group is easily accessible to residents of Los Angeles, Santa Monica, Brentwood, Hollywood and West Hollywood, Los Angeles and West Los Angeles (LA), Marina Del Ray, Pacific Palisades, Culver City, West Hollywood, Orange County, LA, and Century City, which includes the following zip codes: 90035,90034,90064, 90025, 90049, 90067, 90024,90095, 90048, 90019,90046, 90016, 90046, 90210, 90211, 90212, 90213. If you reside in or around the above areas, we hope you will visit our Los Angeles dentist soon!